When attending a trade show, the environment you create is a representation of your organization and what you can provide to your customers. Having the right event signage is an important part of creating a good impression. Within a branded environment, you can communication a sense of professionalism and build trust among the visitors to your booth. Portable displays set up fast and are ideal for use in trade shows, conferences, and corporate events. Portable displays include banner stands, table covers, collapsible displays, and more. Retractable banners are great for trade shows because they are easy to take on the go, no matter where you are. Feather flags and banners are customizable to fit any needs you may have. Standing out in a sea of booths can be hard, but having signage that pops makes it easier to get the customers attention. Where can you buy trade show displays in the Quad Cities? 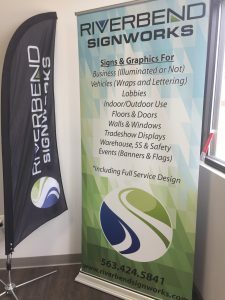 Here at Riverbend Signworks we are dedicated to helping Quad Cities and surrounding areas grow their business through various types of signage. Our goal isn’t simply to make a sign for you, but to understand and develop a message that meets you and your customers’ needs.